Creation of a Local Culture to be Passed Down to Future Generations. 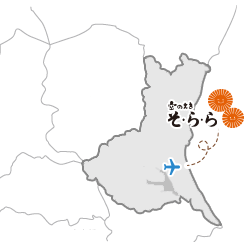 With a population of about 53,000 people, Omitama City is situated in the central part of Ibaraki Prefecture where Ibaraki Airport is located. The city-blessed with a mountainous landscape with fields and woodlands-tops the chicken egg shipment rankings in Japan and is a paradise of food as its agriculture and dairy husbandry prosper. It also has a thriving marine products industry that takes full advantage of its location adjacent to Lake Kasumigaura. 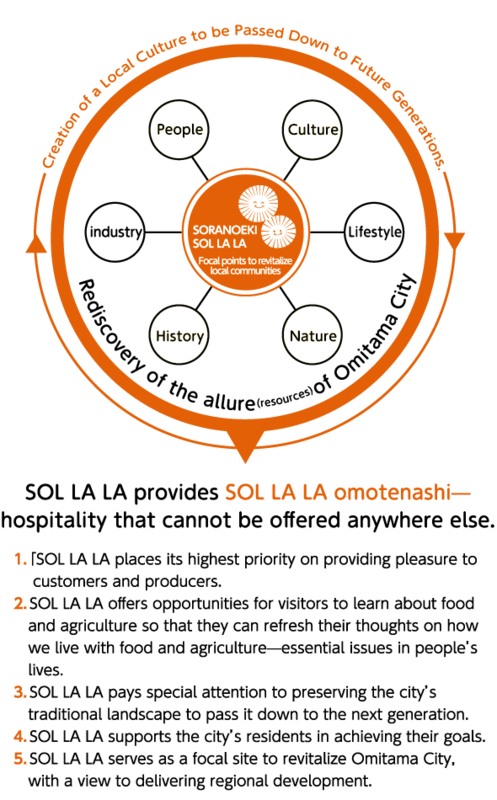 soranoeki SOL LA LA-leveraging these resources and the allure of the city-was built on the passion of local residents striving to establish a focal site to realize local production for local consumption, to facilitate exchanges among visitors, and to revitalize local communities of the city. soranoeki SOL LA LA is a venue where you can rediscover the allure of the city. 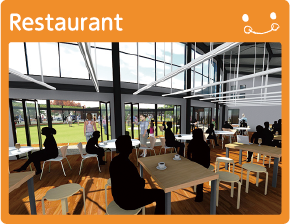 The facility, taking special note of the city’s uniqueness, aims to offer SOL LA LA omotenashi (SOL LA LA’s warm-hearted hospitality) that will bring customers back to the site time and time again. In cooperation with the Tourist Association of Omitama City, SOL LA LA disseminates information on fascinating sightseeing spots of the city, fun events to be held at the facility, forthcoming events taking place in the city, and hands-on experience programs. 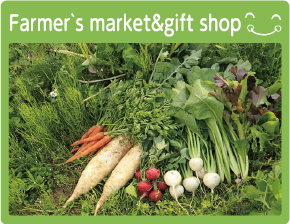 SOL LA LA provides fresh vegetables and fruits grown by local farmers with a fervent passion and a strong sense of professionalism. In addition to local specialties available only in Omitama City, the facility sells souvenirs appropriate to Ibaraki Prefecture’s air gateway to the rest of Japan and the world overseas. SOL LA LA, aiming to operate independently as a resident-participation-based commercial site, puts a plethora of new ideas to commercial use. At the facility, you can enjoy light meals made with a variety of locally grown ingredients. Another fun thing you can experience at the site is meeting local people who lead vibrant lives. A buffet restaurant at SOL LA LA uses the bounty of seasonal ingredients grown in Omitama City. At this restaurant, from which the warmth of the woods emanates, you can truly enjoy quality time with your loved ones such as your family, boyfriend/girlfriend and friends. SOL LA LA strives to produce safe and secure dairy products using raw milk purely locally produced in Omitama City. 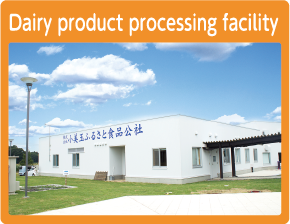 A dairy-products factory at the site-where you are free to observe the factory from outside the building and can purchase dairy products fresh from the factory at its direct sales store-is packed with fun. 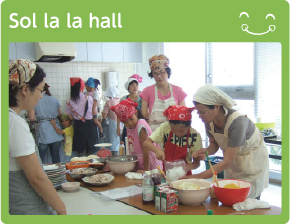 SOL LA LA also serves as a venue where visitors can exchange their views of food, agriculture and other matters, as the facility can be used as a classroom of the Academy of Agriculture and Food and a site for conferences and meetings. Why don’t you come and experience such exchanges while learning about food and agriculture in Omitama City?